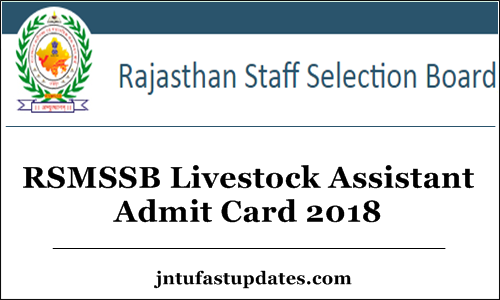 RSMSSB Livestock Assistant Admit Card 2018: Rajasthan Subordinate and Ministerial Services Selection Board (RSMSSB) scheduled the livestock assistant examination on 21st October 2018. Thousands of aspirants applied for livestock assistant posts in the state of Rajasthan can get ready to attend the examination. Candidates must do the perfect grounding to beat the tough competition for livestock assistant posts. Hence the RSMSSB drafted the notification for 2077 livestock assistant posts this year, the competition is also expected to be in the same proportion. All the hopefuls must prepare well to achieve their dream job of livestock assistant job. Candidates competing for the test must download RSMSSB Livestock assistant admit card/hall ticket as a must to proceed with the test. Visit the RSMSSB portal, rsmssb.rajasthan.gov.in to download the hall tickets. The examination officers will check the hall tickets before sending him/her to the examination. If the candidate fails to show the hall ticket, then they will lose the opportunity to attend the test. Hence all the competitors are advised to download and preserve the hall tickets safe to attend the test. Rajasthan Subordinate and Ministerial Services Selection Board (RSMSSB) is one of the state level servicing board that works for various state government operations. The authority annually issues various notifications to employ the suitable candidates into various designations. RSMSSB has recently notified 2077 Livestock assistant vacancies and accepted applications from 12th April to 11th May. Many of the hopefuls seeking to get state government jobs have applied for RSMSSB Livestock assistant posts. RSMSSB is going to shortlist the aspirants based on their performance in the written test, and skills shown in the interview round. Candidates qualifying both rounds with good merit will be finally shortlisted for the RSMSSB Livestock assistant posts. Aspirants applied for the RSMSSB Livestock assistant Posts can get their respective admit cards 10 days before the examination. Probably, the admit card/hall ticket will be accessible from 1st week of October. Candidates can stay checking the official portal for more updates. Livestock assistant examination will be held at a large number of examination centers across the Rajasthan state. All the applicants applied for RSMSSB Livestock assistant posts will have to appear for the test on 14th October. RSMSSB Livestock assistant Hall ticket 2018 and observe the details of their examination center, date, and timings carefully from it. Also, aspirants must have to remember that, without admit cards, they will not be allowed to take the examination. Hence candidates must carry the admit cards while going to the exam. Recheck twice before going to the examination. Search the RSMSSB Livestock assistant Hall Ticket download link in organization website. Check the information in RSMSSB Livestock assistant Hall Ticket 2018.